Report Finds Record-Breaking Coastal Flooding Around the U.S.
High-tide flooding driven by climate change is breaking records on all coasts of the United States, occurring at twice the rate from just 30 years ago, according to a new federal report. And as sea levels rise, coastal flooding will continue to break records over the next few decades at an accelerated rate, according to the National Oceanic and Atmospheric Administration. “The U.S. average high tide flood frequency is now 50 percent greater since 2000 and 100 percent greater than it was 30 years ago,” the NOAA report said. Several cities faced more than 20 days of coastal flooding over the last year even outside of big storms. The top five cities that saw the highest number of flood days and broke records are Boston; Atlantic City, New Jersey; Sandy Hook, New Jersey; Sabine Pass, Texas; and Galveston, Texas. In California, San Diego established itself as the state's coastal flooding hotspot with a record‐breaking 13 days of coastal flooding. 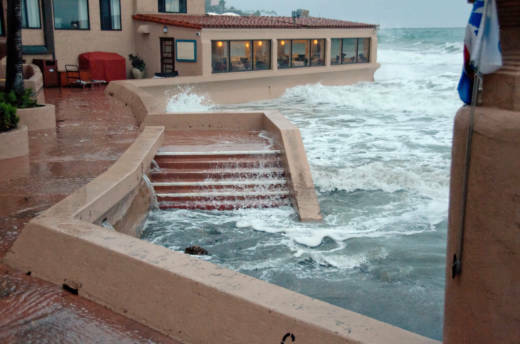 The agency measured rates of high-tide flooding at 98 locations along the U.S. coastline. More than a quarter of the locations tied or broke their previous records, according to the report. "As relative sea level increases, it no longer takes a strong storm or a hurricane to cause coastal high tide flooding," the report said. "High tide flooding causes frequent road closures, overwhelmed storm drains, and compromised infrastructure." Now the state of California is warning nine Bay Area counties that climate change means the bay is rising faster. Extreme tides, whipped by storms, have become both more frequent and more extreme. California’s latest and best word on sea levels, a report issued last spring, predicts that San Francisco Bay could rise from five to 15 times faster this century than the last one. Another proposal envisions a harbor-wide barrier system that would close during major storms and cost billions of dollars. But last week, a city-backed study recommended against building a barrier, saying the money would be better spent on smaller-scale measures, such as flood walls or green infrastructure. New York, which also tied its record of 15 days of tidal flooding, has launched various initiatives...But a signature coastal project that would erect berms and walls to protect lower Manhattan—known as "The Big U"—has faced delays and been scaled back due to its high costs. "Across the whole of the U.S. coastline, we are in dire need of action," Ben Horton, a Rutgers University researcher, told CBS news. Neither the announcement of the high-tide flooding record, the accompanying summary nor the technical report mention the words “climate change,” which scientists widely believe is the underlying cause of sea-level rise and the increasing tides. But in a conference call this week, report co-author William Sweet of NOAA’s Center for Operational Oceanographic Products and Services, told reporters that a third of sea level rise is currently driven by thermal expansion of ocean water, and two-thirds is now caused by the melting of land-based ice around the world -- both processes that are clearly symptoms of global warming.